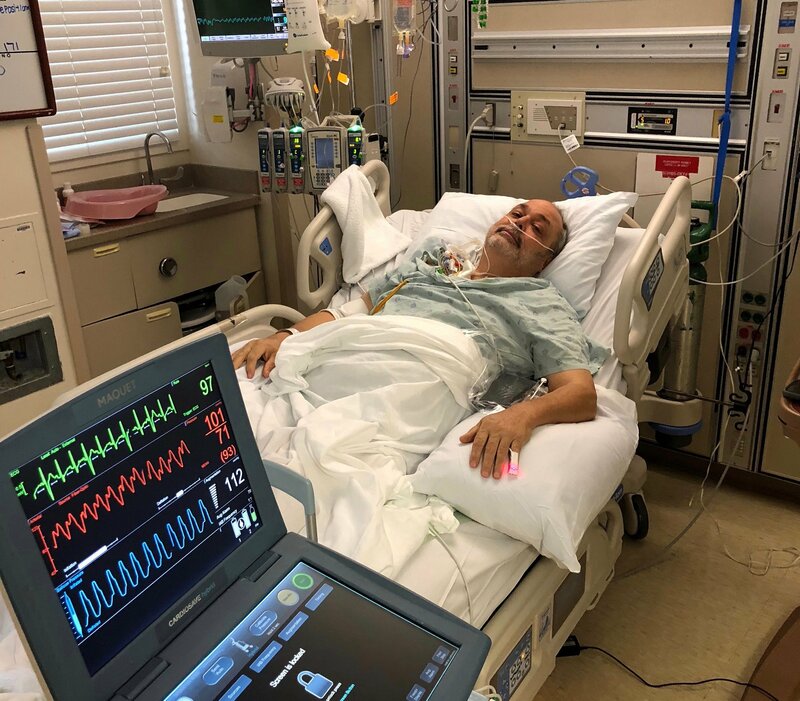 John Pilon is a 59 year old man who is very ill. After suffering multiple heart attacks, and chronic heart failure, a second heart transplant is his only hope for survival. John is a father of two girls, and has spent years being a protector, provider, teacher and hero for them. One of his daughters is learning disabled and John has made helping her through her daily life struggles, one of his top priorities. Transplants are life saving but very expensive. Family and friends of John Pilon are raising money to pay for uninsured medical expenses associated with transplantation. 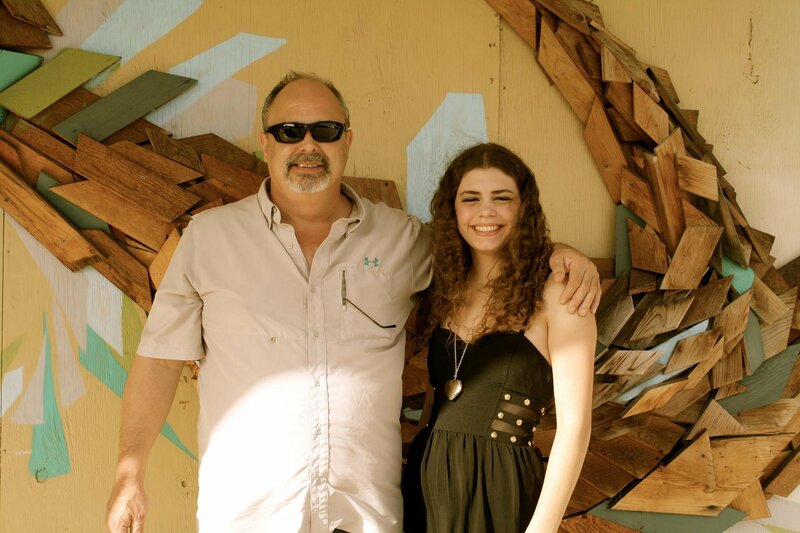 This fundraising page is updated by his youngest daughter, Korey Pilon. John has chosen to fundraise with Help Hope Live in part because Help Hope Live assures fiscal accountability of funds raised and tax deductibility to the full extent allowed by law for donors. Donors can be sure that funds donated will be used only to pay or reimburse medically-related expenses. To make a tax-deductible donation to this fundraising campaign, click on the Give button. John’s surgery for his new impella pump went well! Unfortunately he was not able to hold his own breathing so they had to intubate him. Also, some of you may know that John has been off Dialysis for a few weeks now. Unfortunately he had to restart Dialysis this past weekend. John is still doing well, his feet are severely swollen right now from his body retaining fluids. He has on compression socks to help it go down. Other than that he’s stable and in good spirits! John is officially on Dialysis 24/7, his kidneys have essentially stopped working. He has a new heart pump in called the Impella. It’s supposed to work harder than his first so we’re hoping for fast results. He still has a lot of fluid on his lungs and can’t breath on his own. John was just recently diagnosed with RSV (Respiratory Syncytial Virus) brought on by his weakened immune system. He also currently has a lot of fluid on his lungs and they have inserted dialysis line to help with that. He will start dialysis once they are sure the line has been placed correctly. A few weeks ago doctors thought maybe his kidneys would be able to make it through the heart transplant and that a transplant for them may not be as urgent but after this recent update they no longer think the kidneys will be able to make it that long. Thank you all so much for your support! Sorry I haven’t updated in a while! There’s not much to report, just a lot of waiting! 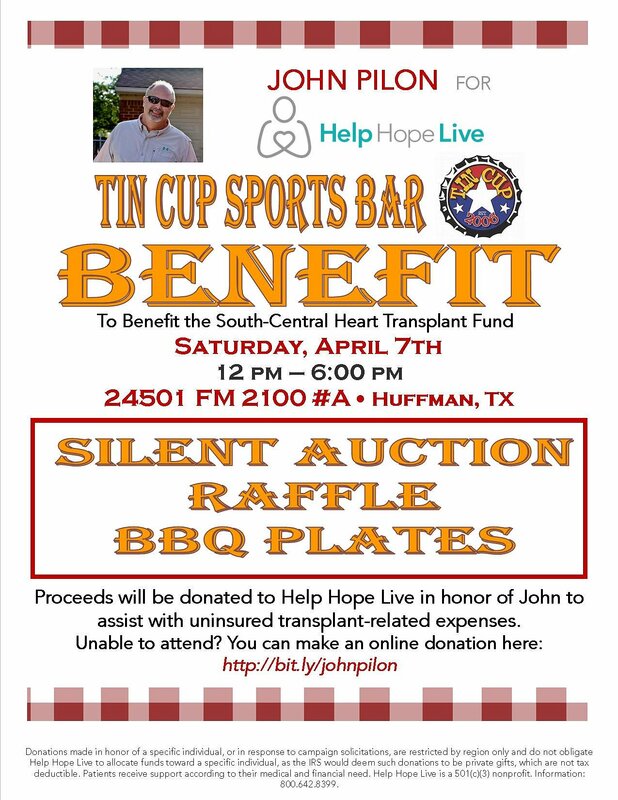 In other news, on April 7th there will be a benefit held at Tin Cup Sports Bar in Huffman Texas from Noon to 6pm. There will be a raffle and a silent auction! More news to follow! John’s heart pump ruptured the other night so they had to replace it. All is well right now, just waiting for a heart to come! John has officially been accepted on to the transplant list for a heart and a kidney! He’s a level 1A wich means he’s considered to be one of the most critical, unfortunately this process could still take a couple of months, so he still has a long way to go! Thank you again for everyone’s support! Today is John’s 59th Birthday! We’re still waiting to hear if he’s been officially accepted to be a heart transplant recipient. Doctors are currently running more tests on his kidneys to see if a kidney transplant might be needed as well. Thank you to everyone for your support and donations! We’ll continue to keep everyone up to date! The doctors have deiced to remove his heart pump (that’s currently in his groin) tomorrow and plan on transferring it into his chest later in the week. Doctors meet tomorrow to discuss the possibility of officially putting him on the transplant list! After consulting with doctors, they’re discussing moving his pump up to chest. It is now currently in his right leg. The decision should be made Monday. John was seen by neurologist today to set up an order for CT Scan. We found out that during his last visit at Memorial Herman he suffered a thalamic stroke and it went unreported to us until now. John was admitted at Methodist hospital yesterday to have a heart pump inserted and is currently in the Critical Care Unit. Praying for all the best to you John! I plan on attending. I love you brother.